Introduction: Identifying the need for strengthening of the immune system, the investigator has developed new Human Immunodeficiency Virus (HIV) nosode and evaluated its effect on HIV positive individuals through a clinical trial. Methods: Standardized and the scientific method of HIV nosode preparation has been described and documented. Thirty-seven HIV-infected persons were registered for the trial, and ten participants were dropped out from the study, so the effect of HIV nosode 30C and 50C, was concluded on 27 participants under the trial. Results: Out of 27 participants, 7 (25.93%) showed a sustained reduction in the viral load from 12 to 24 weeks. Similarly 9 participants (33.33%) showed an increase in the CD4+ count by 20% altogether in 12 th and 24 th week. Significant weight gain was observed at week 12 (P = 0.0206). 63% and 55% showed an overall increase in either appetite or weight. The viral load increased from baseline to 24 week through 12 week in which the increase was not statistically significant (P > 0.05). 52% (14 of 27) participants have shown either stability or improvement in CD4% at the end of 24 weeks, of which 37% participants have shown improvement (1.54-48.35%) in CD4+ count and 15% had stable CD4+ percentage count until week 24 week. 16 out of 27 participants had a decrease (1.8-46.43%) in CD8 count. None of the adverse events led to discontinuation of study. Conclusion: The study results revealed improvement in immunological parameters, treatment satisfaction, reported by an increase in weight, relief in symptoms, and an improvement in health status, which opens up possibilities for future studies. Antiretroviral Therapy (ART) regimes allow immune reconstitution but not normalization of the immune response. Therefore, additional therapeutic approaches need to be developed that include the use of immune-based therapy. Therefore, new innovative remedies having immunological potential to enhance the immune system, Standalone or along with anti-viral treatment, is the need of the hour. Identifying this need, the Investigator has developed homoeopathic preparation called HIV nosode and evaluated its effect on HIV-positive humans. He is interested in exploring ways to support immune response to prevent the progression of AIDS, as well as to reduce the number and intensity of opportunistic infections and to improve the overall state of health. Preventing, controlling and treating opportunistic infections, catabolic wasting or cachexia, etc. Extremely diluted and potentized preparations have shown to retain starting material in the form of nanoparticles. Clinical efficacy of potentized preparations in HIV management has been shown in clinical studies. Efficacy of homoeopathic medicine has been questioned by some in the past. The law of similar, the fundamental homoeopathic principle, which states that any substance, which has a capacity to produce symptoms in humans, also has the capacity to relieve similar symptoms, if administered in very small dose. As the HIV virus produces AIDS and related diseases, it was decided to examine the hypothesis of Homoeopathy through this study of examining the role of the HIV nosode in HIV-infected participants. The investigator has conducted Homoeopathic Pathogenetic Trial (a method to investigate the effect of potentized substance on healthy human volunteers, N = 22) of HIV nosode (accepted publication) and documented the capacity of the nosode to produce 130 symptoms in healthy volunteers. An Institutional Ethics Committee approved the project of HIV nosode preparation as well as the informed consent forms. Blood samples from HIV-infected consented donors (type I and II, one volunteer each) were collected for preparing the nosode. The volunteers were negative for other possible co-infections. Sera from two samples was separated, mixed, and processed for making the source nosode. Standardization of this source nosode with respect to viral count (4153 viral copies by Polymerase Chain Reaction (PCR) method in HIV type 1  (excluding HIV type 2 viral copies as the method for its quantification was (2010) unavailable), protein profile, and pH was done. One part of the source nosode was mixed with 99 parts of vehicle (water for injection or alcohol) and then exposed to rigorous process called potentization giving 10 strokes with standardized potentizer (electro-mechanical devise, impact of stroke calculated) to obtain 1C potency (10−2 ). One part of 1C was again mixed with 99 parts of vehicle to repeat the process, to arrive to 2C (10−4 ), and likewise 3C, 4C,…, 30C (1−60 ), etc., are prepared. Fifteen steps, a standardized and scientific method of nosode preparation with an example of HIV nosode has been described in detail. The potencies up to 6C were prepared using water for injection, and above 6C potencies were made using alcohol as vehicle. The extremely diluted (potentized) homeopathic medicines are generally administered in 30C, 200C (or more) potencies. Standardization of 30C potency and its safety in terms of absence of viral copies by PCR and ultra-electron microscopy was done. The 30C potency was found to be free from HIV virus. An exploratory clinical trial was conducted in 36 seropositive participants. Participants were enrolled in the study as per inclusion and exclusion criteria described in the protocol. CD4 absolute count more than 350 cells/μL was one of the inclusion criteria. HIV nosode 30C for first 3 months and 50C for next 3 months were prescribed to the participants. Participants were monitored every 6 weeks during follow-up visits. The dose of six pills (size 30) 3 times a day sublingual was administered to each participant. The documentation such as patient informed consent forms, laboratory investigations at the central laboratory, safety, and ethical measures were taken care of. The participants were followed critically for 6 months, and collected data were analyzed. Participants were monitored for CD profile and viral count at scheduled visits. Participants were examined by HIV AIDS specialist, specific investigations if required were done at central laboratory. Participants whenever required were referred to the counselor at the nongovernmental organization (NGO) for counseling as per the requirement. 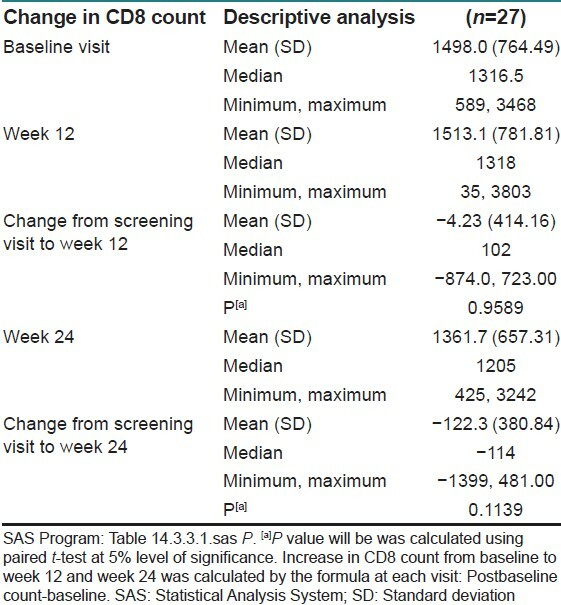 Treatment in terms of reduction in HIV viral load compare to initial load (baseline), increase in CD4 count by 20% after 12 weeks or 24 weeks, decrease in CD8 count from baseline after 12 weeks or 24 weeks, change in CD4 %, percentage of participants for sustained reduction in viral load after 12 and 24 weeks of treatment, overall improvement in health (such as weight gain, improved appetite, less opportunistic infections) and health status reported by participant receiving 12 and 24 weeks treatment were evaluated. Treatment of responders (the participant who positively responded to nosode) and non responders was also reported. The project was reviewed and approved on 16 th September 2010, by Institutional Ethics Committee, (Homoeopathy India private limited) constituted as per Indian Council of Medical Research (ICMR) guidelines. The requirements regarding the obligations of investigators as per 'Guidance on Good Clinical Practice' (GCP) and International Conference on Harmonization of Technical Requirements for Registration of Pharmaceuticals for Human Use Independent Ethics Committee  were met with. The study has been registered (CTRI/2011/12/002228) with the Clinical Trials Registry-India,  set up by the ICMR's National Institute of Medical Statistics. Female patients of child bearing potential must have a negative pregnancy test prior to IP administration. Female patients must agree to use effective birth control methods during the course of the study. Independent agency (contract research organization) carried out data entry, and the data analysis after database was locked. Continuous data were presented by descriptive statistics N (number), mean, standard deviation, median, minimum and maximum values. Categorical data were presented as frequency (n) and percentage. Comparison of variables representing categorical data were performed using Chi-square or Fisher's exact test. Mean differences of continuous variables from baseline were examined by t-test or analysis of variance if more than two subgroups (factor categories) were included. All P values were reported based on two-sided significance test, and all the statistical tests were interpreted at 5% level of significance level. Analysis was carried out using Statistical Analysis System program. Efficacy results were on protocol population and safety was on the intention to treat population. 59 participants were screened, 22 were excluded. Many of the participants failed to satisfy the inclusion criteria for CD4 count ≥350 CD4+ cells/mm 3 and satisfied the exclusion criteria of having clinically suspected tuberculosis who were on or eligible for AKT. 36 participants were enrolled in the study of which 9 did not provide outcome data while 27 participants completed the study. 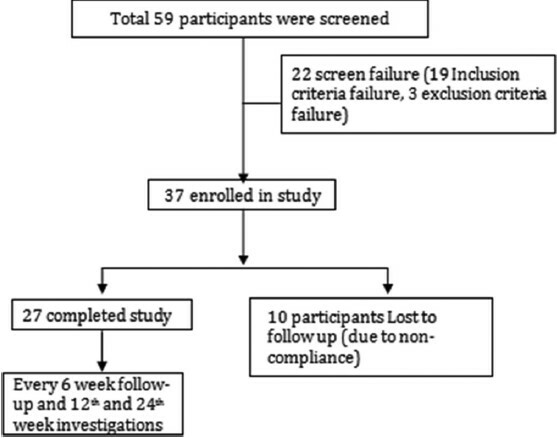 8 participants were lost to follow-up and one participant voluntarily withdrew consent [Figure 1]. 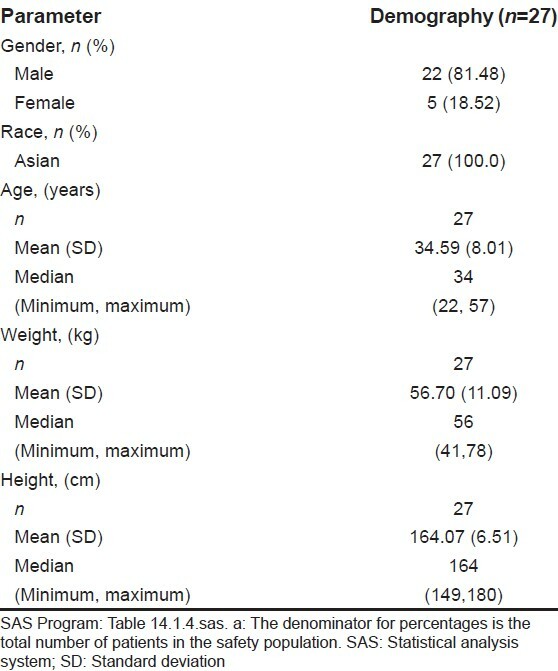 All participants were Asians, with a mean age of 34.39 (standard deviation = 7.98) years, mean weight of 56 kg; 83.33% of the participants in the study were males [Table 1]. All participants were only HIV type I infected. Most of the participants enrolled in this study were from NGOs and drug-addiction centers. Few participants were shifted to another NGO and hence lost to follow-up. However, the telephonic conversation with NGO confirmed the safety of such participants. Of 27 participants, seven responders (25.93%) showed a sustained reduction in the viral load from 12 to 24 weeks [Table 2]. 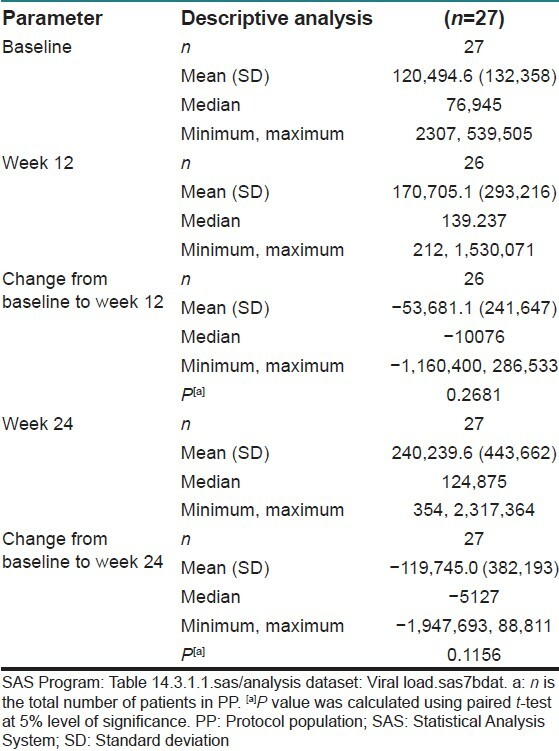 Overall the viral load is increased from baseline to week 24 through week 12 in which the increase was not statistically significant (P > 0.05) [Table 3]. 18.52% (5 of 27) participants showed an increase in CD4 count by 20% at 12 th week with 30C potency of the nosode, not sustainable, as count of these participants dropped at 24 th week. With 50C potency, increase in CD4 count by 20% was observed in 14.81% participants [Table 4]. Overall, it was observed that 37% (10 of 27) participants have shown improvement (1.54 - 48.35%) in CD4% count and 15% (4 of 27) participants had a stable CD4% count until visit 5. Thus, 52% (14 of 27) participants have shown either stability or improvement in CD4% at the end of 24 weeks. [Table 5]. In this study, 16 out of 27 participants had a decrease (1.8-46.43%) in CD8 count and eleven participants showed elevated CD8 count (not statistically significant), such an over-stimulation of CD8 response and an elevated cell count was clinically associated with accelerated HIV disease progression [Table 6]. No statistically significant change was observed in the CD8 count and CD4 percentage count from baseline to week 12 and week 24. Weight gain was seen in participants at both 12 weeks and 24 weeks; the mean increase being 2.02 and 1.67 kg, respectively. 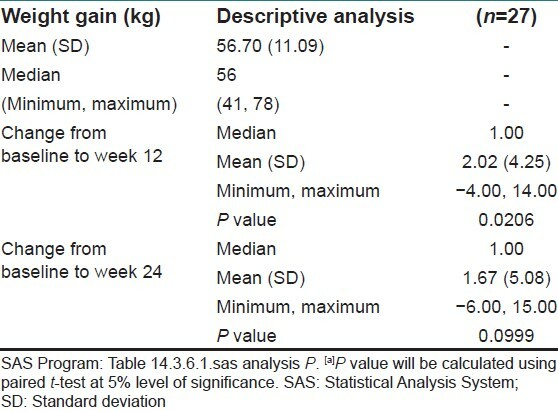 Significant weight gain was observed at week 12 (P = 0.0206) [Table 7]. A significant proportion of participants, 63% and 55% showed overall improvement in either appetite, or weight gain or reduction in opportunistic infections at week 12 and week 24, respectively as per individual patient narratives for opportunistic infections [Table 8] and [Table 9]. Patient-wise short narratives were prepared, and the Investigator and HIV consultant opined clinically on the general health (weakness, feeling of well-being and treatment satisfaction) and improvement in terms of relief from symptoms and recurrence of infection. Sixty percent of the patients had improved in terms of the general condition, relief from symptoms and recurrence of infection. 3 (11.11%) out of 27 participants had infection at baseline. The number of participants having infections increased from 3 to 13 (of 27) at week twenty-four. Upper respiratory tract infection (5 participants) was the most commonly observed infection. One case of lower respiratory tract infection was observed. This may indicate the disease progression. Increase in fatigue from 0 at baseline to 4 at the end of 24 th week was observed. 22 (66%) of 36 participants experienced Adverse Events (AEs). None of the AEs was serious. Most of the AEs (72.73%) experienced by the participants belonged to the system organ class of infections and infestations, followed by 'respiratory, thoracic and mediastinal disorders' (40.91%) and 'general disorders and administration site conditions' (40.91%). The most common AEs reported were URTI (40.91%) and nasopharyngitis (40.91%), followed by pyrexia (31.82%). None of AEs and serious adverse events was suspected to be caused due to the study drug. All the AEs reported during the study were mild in intensity. This was an exploratory study to evaluate a new homoeopathic medicine, HIV nosode, for the treatment for HIV. This study was conducted to examine the role of the HIV nosode in HIV-infected participants and to explore its efficacy and safety. Since this nosode was sourced from biological material, its safe use in human was documented carefully by testing for viral copies and genetic material. Inventor had also tested this nosode on healthy volunteers through a separate study, the Homoeopathy pathogenetic trial, and documented its safe use. An overview of the results and the individual patient narratives reveal that most participants in different stages of the disease, experienced treatment satisfaction as reported by an increase in weight, relief in symptoms and improvement in health status, during their scheduled visits. The progression of HIV illness depends on the increase of viral load and depletion of CD4+ count. The efficacy of the HIV nosode may be evaluated on enhancement of CD4+ count and reduction in viral replication. The participants who responded positively to the nosode therapy had shown18.52% increase in CD4 at 12 th week with 30C potency of the nosode, not sustainable, as the count of these participants dropped at 24 th week. With 50C potency, increase in CD4 count by 20% in 14.81% patients, further follow-up of these patients not available to observe whether count sustained or not. In the responder group, 25.93% participants have shown a sustained reduction in the viral load from week 12 to 24. Overall the viral load increased from baseline to week 24; though the increase was not statistically significant (P > 0.05). A mixed response was observed at week 24, wherein some participants improved and some had a relapse in their symptoms. Elevated CD8 count in eleven participants may show the HIV disease progression. The limitation of the study was lack of the control group and hence it is difficult to arrive at the conclusion whether this fall in CD4 is related to the treatment or the natural course of the disease. This also could point to the possibility that 30C potency gave a better result than 50C potency, as a shift from 30C to 50C led to weakening in results after week 12. Other limitations of the study were 25% dropout rate, small sample size, lack of the placebo arm and short duration. It may be noted that placebo control study has not been possible for a disease like HIV due to ethical reasons. A follow-up study to evaluate either the continuation of the lower potency (30C) for a longer duration or therapy for a shorter duration, and control group (randomized control trial) in a greater number of participants is warranted. Author has conducted clinical trial in the participants having HIV infection to examine the fundamental Law of Similars used in Homeopathy. The homeopathic pathogenetic trial, a placebo-controlled study on healthy human volunteers conducted by the author has demonstrated effects of ultra-diluted, potentized HIV nosode in 30C potency by producing a set of symptoms comparable with those due to the HIV virus. The mechanism of the action of the nosodes is not yet understood. The research may be supported by further study to examine if the action of the nosode as immunomodulator or immunostimulatory. It must be noted that this study is one of its kind involving homeopathic nosodes, which are vaccine like preparations sourced from organisms. The systematic effort has been made to evaluate its effect in HIV-inflicted individuals. The study may be considered a beginning of a series of many experiments with (a) different organisms and nosodes (b) evaluation of various biological markers (c) use of nosodes as adjuvant therapy (d) using nosodes along with constitutional homoeopathic medicine. Clinically, improvement in terms of general condition of patient and improvement in CD4 count may help prolong the need for ART treatment; however, more clinical trials in a large number of participants with participants having homogeneous immune status are obligatory. The most notable features of this study include results such as 25.93% participants showed reduction in viral load, 33.33% participants showed an increase in the CD4+ count by 20%, significant weight gain (P = 0.0206), 37% participants have shown improvement in CD4% count and 15% participants had a stable CD4%, and overall improvement in health status. The study revealed improvement in immunological parameters, treatment satisfaction, reported by an increase in weight, relief in symptoms, and improvement in health status. Taking into consideration the results of this study, homoeopathic therapy in the future can be explored as adjuvant or stand-alone, which opens up possibilities for future studies. Members of Institutional Ethics Committee, subject experts for their technical, ethical, legal and medical inputs; and the volunteers for their participation in the study. Available from: http://www.ncbi.nlm.nih.gov/pmc/articles/PMC2886291/. [Last accessed on 2013 Mar 01]. Krantz EM, Hullsiek KH, Okulicz JF, Weintrob AC, Agan BK, Crum-Cianflone NF, et al. Elevated CD8 counts during HAART are associated with HIV virologic treatment failure. J Acquir Immune Defic Syndr 2011;57:396-403. Hwijin K, Alan SP. Viral and latent reservoir resistance in HIV-1-infected participants on therapy. PLoS Comput Biol 2006;2:e135. Available from: http://www.manbir-online.com/std/hiv. 3.htm. [Last accessed on 2013 Mar 01]. Mishra N, Prasad P, Bhuvaneshwari S, Singh V, Muraleedharan KC, Dey S, et al. HIV infection. Clinical Research Studies Series 1, New Delhi: CCRH 2008;1:67-82. Rastogi DP, Singh V, Singh VP, Dey SK, Rao K. Double blind placebo controlled clinical trial of homoeopathic medicines in HIV infection. Br Homoeopath J 1998;87:86-8. Allen TF. Encyclopedia of Pure Materia Medica. Vol. 10. New Delhi: B. Jain Publishers; 1810. Hering C. The Guiding Symptoms of Our Materia Medica. Reprint ed., Vol. 10. New Delhi: B. Jain Publishers; 1989. p. 211, 350. Shah R. Hepatitis C Nosode: The preparation and homeopathic pathogenetic trial. Homeopathy 2013;102:207-14. Chikramane PS, Suresh AK, Bellare JR, Kane SG. Extreme homeopathic dilutions retain starting materials: A nanoparticulate perspective. Homeopathy 2010;99:231-42. Muraleedharan KC, Dey S, Prasad P, Siddiqui VA, Dixit R, Singh V, et al. Effectiveness of homoeopathic medicines in HIV patients - A clinical trial. Indian J Res Homoeopath 2010;4:29-35. Shang A, Huwiler-Müntener K, Nartey L, Jüni P, Dörig S, Sterne JA, et al. Are the clinical effects of homoeopathy placebo effects? Comparative study of placebo-controlled trials of homoeopathy and allopathy. Lancet 2005;366:726-32. Hahnemann S. Organon of Medicine. 6 th ed. New Delhi: Jain Publishers; 1981. p. 109-10. Shah R. Scientific method of preparing homoeopathic nosodes. Indian J Res Homoeopath 2014;8:166-74. Available from: http://www.ijrh.org/text.asp?2014/8/3/166/141740. [Last accessed on 2014 Oct 21]. Indian Council of Medial Research. Ethical Guidelines for Biomedical Research on Human Participants. New Delhi: Indian Council of Medial Research; 2006.
International Conference on Harmonisation of Technical Requirements for Registration of Pharmaceuticals for Human Use, ICH Harmonized Tripartite Guideline, Guideline for Good Clinical Practice, E6 (R1). June 10, 1996. Available from: http://www.ctri.nic.in [Last registered on 2011 Dec 14]. Global Fund Support Extends Antiretroviral Treatment to 4.2 Million People. Geneva; 2012. Available from: http://www.theglobalfund.org/en/mediacenter/newsreleases/2012-11-29_Global_Fund_support_extends_antiretroviral_treatment_to_4,2_million_people/. [Last accessed on 2013 Mar 01]. Tebas P. Cutting - Edge Issues in HIV Medicine (Symposium). Available from: http://www.thebody.com/content/art31916.html?nxtprv. [Last updated on 2001 Oct 19; Last cited on 2013 Mar 02; Last accessed on 2013 Aug 10]. Arjanova OV, Prihoda ND, Yurchenko LV, Sokolenko NI, Vihrova LA. Impact of adjunct immunotherapy with multi-herbal supplement Dzherelo (Immunoxel) on treatment outcomes in end-stage TB/HIV participants. J Antivir Antiretrovir 2009;1:86-8.